3D Storytelling is the ultimate guide for directors, cinematographers, producers, and designers of stereoscopic 3D movies and videos. 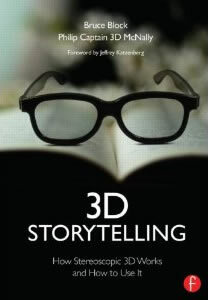 With an emphasis on the aesthetic over the technical, this book is an essential foundation for showing you how to use 3D creatively to tell a story. Brimming with practical information that can be immediately applied to your 3D production, the book also features interviews with some of the industry’s leading stereographers, as well as 3D diagrams and photographs that illustrate how 3D works, how it can be controlled in production, and how 3D can be used to tell a story.